It’s not true that history repeats but it certainly stutters, and at the moment its syllabic stopping point in James. LeBron James. Not shaken. Unstirred. The Eastern Conference Vishnu, the not-so-secret destroyer of dreams for teams this side of the (figurative) Mississippi. There is no answer for him, only questions, for any attempt to stop him almost inevitably unravels at the other end. The supposition in Toronto, and for many NBA observers, was that the addition of two gritty, defensive minded vets (PJ Tucker and Serge Ibaka) capable of stretching the floor would help Toronto survive the onslaught. If they’ve provided any protection, it’s been like an umbrella in a tsunami, because the Raptors are taking on water like Natalie Wood. When last we wrote – mea culpas on that at the end – we noted now last year’s break between the first and second rounds was key in the team’s playoff development. They came into the Hawks series last year with the offense humming like Hollywood casting directors’ desks. Last year the Cavs posted TWO record setting three-point shooting performances against the Hawks, providing a nice correlation with the Cavaliers’ 8-8 start from beyond the arc on Wednesday. Getting into good shape is probably also a good idea seeing as how they never played that hard in the regular season. (RJ even admitted the other night that they struggled to take the regular season seriously.) But that said, it’s hard to deny that Cleveland’s defense has found a new level. You could call it flipping a switch, or perhaps even suggest that when James transforms into He-Man like Rudolph, he leads his mates to another level, if only by subconscious shaming. The Cavaliers’ execution of the gameplan has been excellent, and their in-game focus pretty exemplary, especially in Game 2. 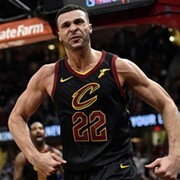 There’s an element of Apollo Creed and Rocky Balboa in this matchup, inasmuch as the Raptors are a methodical, grinding team who’s primary skill, so far as the Cavaliers series has gone the past two years, is taking a punch. The only thing that ever really scares you about the Raptors is that they’re tough to put away for good. They’ll hang around down 8-12 points for quarters at a time, utterly resistant to the finishing blow, face bloodied, still ready to fight. That grit showed signs of cracking on Wednesday, as garbage time erupted in the third quarter when for a brief moment Kyrie Irving showed the skills to take over we know he has (on both sides, no less) but which have been mysteriously missing so far this post-season. Kyrie’s not been hitting his threes – even though he’s taking significantly more than in past years and he’s making more turnovers, though he’s also increased his passing. This is a subtle sign of maturity that showed its face last night. Kyrie was 2-11 in the first half, but had 7 assists, as he adjusted his game and started looking for others. In the second half his shooting normalized (4-8, 2-4 from 3, 15 points) and he flashed his defensive skills. These two steals and the plays he made off them (notably not trying to score on either of these breakaway opportunities) helped finish a Raptors team that had until then clung tightly to the halftime margin. None of which is to take anything away from LeBron James, who was in force not for moments but the entire game. James scored 17 points on five shots sinking seven of eight free throws and consecutive threes that still did not break the Raptors spirit. If you had a fear of Toronto, this is the part that concerned you. But the cracks they showed in the middle of the third, and the Cavaliers resolve not to let them back into the game are definitely encouraging. After the game, Irving acknowledged their need to retain their focus and effort level. That understanding maybe was a little missing last year. Sure they said it, but after winning 10 straight to start the playoffs and beating the Raptors by a combined 50 points, they were undoubtedly a little overconfident heading north last year. 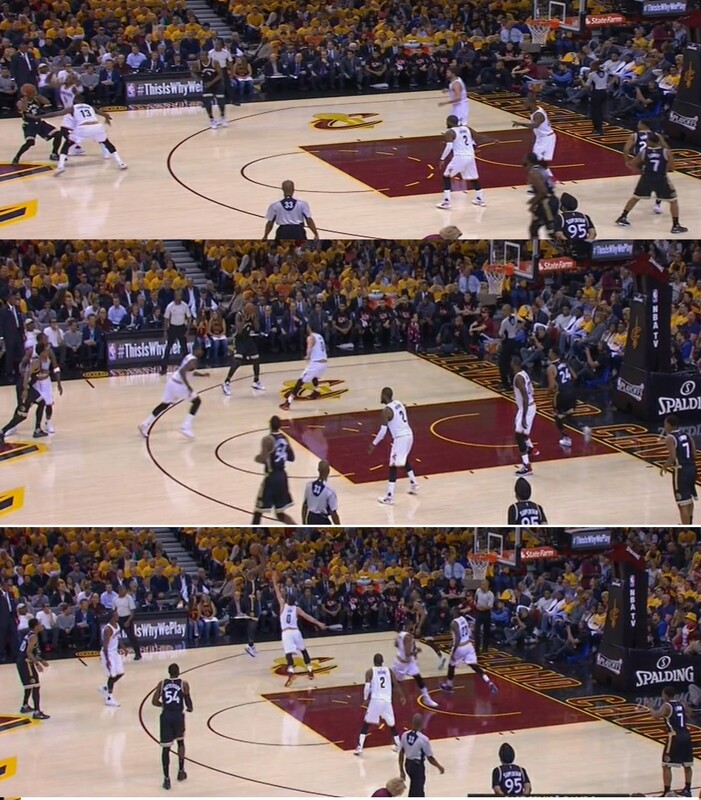 Below are consecutive first half threes by James, taken when the Raptors tried to put Ibaka on him. This year Cleveland seems to better understand the task at hand. With just six more victories before the Finals, the Cavaliers appear ready for the challenge. Indeed, it almost seems better meeting a physical, grind-it-out team now, when the Cavs have had some rest and seem very focused, than in the Final round after another second round roll. Indeed, the slower paced, rough and tumble tempo of last year’s Eastern Conference Finals seemed to contribute to the team’s one-step slow start in Games 1 and 2 in Golden State. 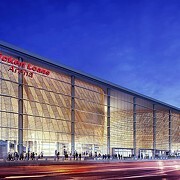 Either the Celtics or the Wizards will offer better preparation for the West than Toronto did last year. Did DeRozan Choke or Did Smith Smother Him? One of the frustrating things for the Raptors was that while Lowry and Valanciunas were hanging tight with the Big Three (a collective 34 to the Big 3’s 35), DeRozan was providing nothing. Indeed he missed two free throws at the end of the second quarter when the Raptors lost composure and blew the lead they’d cut (slightly) into, after surrendering a 12-0 run in the mid first quarter, a hole they fought to get out of all half. DeRozan was 0-7 and the Cavaliers were taking special care to bottle him up by trapping every pick-and-roll. The Cavs showcased this look from the start essentially playing a trap-and-triangle defense that left a zone-triad defending the paint.They weren’t trying to get the ball with the trap – none of the defenders are really covered. 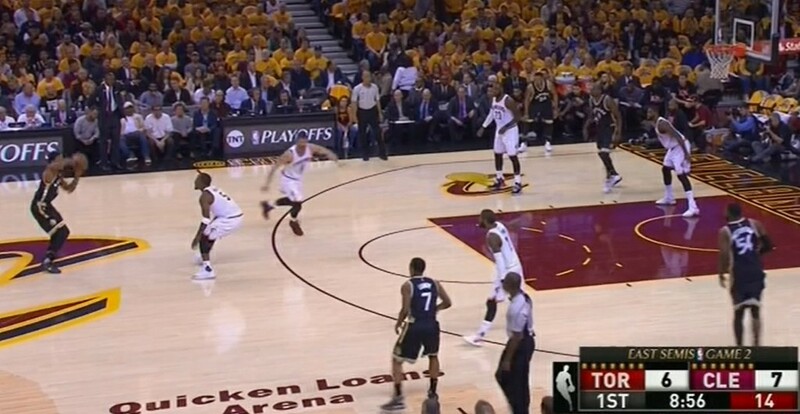 Not in the photo below that Powell screens for Lowry by the right break, but the Cavaliers ignore it. They simply making sure DeRozan either gives up the ball or has little opportunity to get downhill off the bounce. As you can see in this first picture, when Patterson screens DeRozan’s man (J.R. Smith), Love steps up to trap him and force him to either pass or dribble back, upcourt to escape the trap. While there were a couple occasions where DeRozan split the trap, the Cavaliers generally sealed him up better than King Tut, and force the Raptors to get creative. The Raptors tried sending Powell along the baseline under the basket, but Thompson and James keenly communicated responsibilities to effectively parry Toronto, as Ibaka settled for a jumper. They had some success springing Patterson and Lowry for threes with effective weakside action. In the first picture, DeRozan kept Love occupied trapping him for long enough that Patterson reached the weakside. Love couldn’t reach the opposite corner before Patterson dropped the three. They did a similar thing to spring Lowry on the weakside after running Kyrie into a weakside screen. DeRozan hit Patterson in the middle of the floor, who passed it to Lowry, who drained the three before the Cavaliers could rotate.But aside from those plays, the Raptors essentially stopped trying to work the side to side stuff and generally let DeRozan try to get his shots in essentially 1-on-1 situations. While the Raptors hardly move the ball as well as the Warriors, Spurs or even Celtics, it is inspiring to see how quickly everyone rotates on the below play. You’ll note that Powell initiates the offense, something the Raptors started doing to keep James from helping so much, and playing centerfield. He can’t do that as easily when Powell starts the offense. That doesn’t stop James from collapsing on the DeRozan drive. Recognizing this DeRozan kicks it to Powell who probably should’ve taken it. But instead of shooting or driving the Love closeout he kicks it corner where Tristan Thompson recovers too quickly for Patterson to pull the trigger. He tries to drive, but James, back in centerfield cuts off the baseline and Patterson throws it out of bounds trying to get it to the opposite corner. It’s the right play, but as the sadsack, bad luck CIA at center of The Patriot will tell you, getting something from A to B is simpler in concept than execution. These strong rotations likely played a role in letting DeRozan attack without screens or once the help has scrambled back. Indeed, when you look at the shots that DeRozan got in isolation they don’t especially hard – considering he scores most of his points off the bounce on midrange jumpers. We wouldn’t necessarily credit J.R. Smith so much as the defense as a whole with frustrating DeRozan and taking him out of his comfort zone enough that he missed the kind of somewhat contested shots he usually makes. Lots of them. We’ll see how easily Cleveland replicates that on the road. It’s a well-known playoff idiom that role players get tight throats/sphincters on the road. Up until now the Cavaliers have been trying to make the Toronto role players beat them. At times Valanciunas and Ibaka have done just that – but only for a half at a time. After scoring 19 in the first half, The Raptors answer to Lurch scored just four more points, two of them at the line. Lue will take away players that are beating Cleveland in the second half, but Toronto has yet to prove resourceful enough to take advantage and make their own adjustments. Whatever Norm’s virtues – which break down to the ability to initiate the offense and enough athleticism to sorta cover LeBron, who’s had consecutive 30-point games – he very literally killed the Raptors during two crucial sequences, helping the Cavaliers plunge the knife in deep enough there was no pulling it out. It’s no surprise that Powell was a team worst -24 +/- for the game. First he seems to make the right decision and pull it out only to blow off the screen and attack LeBron one-on-one, which meant going airborne before throwing a bounce pass six feet to the left of DeMarr DeRozan in the corner. To amplify matters he grouses and shakes his head while James is quickly running up court, receiving the inbounds and slamming the ball – a potential four-point swing, giving the Cavs a 12-point lead. Moments later, still down 12, the Raptors push and Powell blows the layup attempt over James, which led to a fast break the other way. Lowry had to(?) leave Shumpert while he waited for Powell to make it up court, allowing the skip pass to Shump in the corner for a three, a five-point swing, total, nine-point swing in a 14-point Cavs halftime lead. 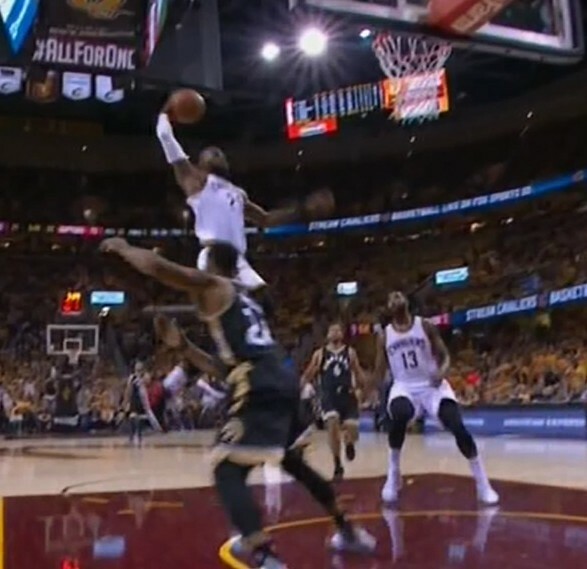 Then in the second half he let Tristan Thompson go free for an easy dunk, because, presumably, that was worse than getting a couple feet further away from James, whom was already 6’-8’ away? But his woes go on. Powell let Kyrie steal the ball from him in the aforementioned Kyrie explosion that blew open a not-very close game in the third quarter. Powell’s a young kid, so it’s hard to extrapolate his performance from one game to the next, especially now that they’re going home. But whatever issues Powell allowed the Raptors to address with his athleticism, are being wiped out by silly green mistakes and poor decision-making. It seems that Carroll or Tucker could at least be counted on not to make the team worse with their play, if it’s obviously hard to see them really helping the Raptors that much. Still, when you’re a grinder, the key is not to be hurting yourself, they just can’t afford it, and certainly not against a team as explosive as the Cavaliers. It’s difficult to level too many complaints about the offense. The Cavaliers are shooting 49% from the field and a sizzling 43% from beyond the arc, worth 14 threes/game. Their 117 pCp offensive rating is an improvement of six points over the regular season – very comparable to last year’s 4.5 pCp improvement, especially considering two arguably tougher rounds lie ahead. Just as we predicted, there has been almost no improvement in the defense (107.7 pCp in playoffs vs. 108.0 regular season), but a six-point overall improvement is more than enough to swing things as last year proved. However there are still a couple small causes for worry. The Cavs still struggle to grab defensive rebounds (75%, 10th among 16 playoff teams) and have been middle of the pack on the offensive boards well (22.3%, 9th). They’ve given up 12.2 second chance points/game (9th), 10.2 fastbreak points (7th, last year 1st), and 43.7 points in the paint (10th). They’ve allowed the 7th-highest opponent EFG% (51.8%) and are forcing the 9th-most turnovers. Hopefully that offers a fair enough view of how completely mediocre the team’s defense has been. While the offense has been better, Love hasn’t really been a part of it. As always, it doesn’t seem entirely his fault; he’s simply the guy most likely to lose shots when James and Irving want more. Indeed, Kevin’s struggled since the opening two games of the first round, when he went 11-16. He typically does worse on the road (6-25 in Indiana) but he hasn’t set the world on first this round at home, going 9-22 with 16 boards, just one of them offensive. He’s playing hard, but he’s not seeing the ball much. He had 13 first half shots (made 8) and 9 second half shots (made 1), including just three on Wednesday. The way James and Irving have played in the second half the last two games it’s probably not entirely important if other players don’t much figure. James has 42 second half points through two games and Kyrie has 23. However if the Raptors can figure out some way to slow James and Irving, Love’s demotion to the second shelf could be more problematic. That said, this offense is on much firmer ground than last year when guys were STILL feeling out their roles. After three years together the Big Three at least know where each other works and the whole operation run relatively smoothly. Of course, it also bears mentioning that this is because of both LeBron James, who is averaging 34.2 points, 9.2 rebounds, 7.3 assists, 2.7 steals and 1.8 blocks, while shooting 57% overall and 48% from three. He’s the obvious factor, but there’s a less obvious one. Tristan Thompson is only averaging 7.8 points and 11.2 rebounds, but what he does out there transcends the stats. His energy and effort are the glue holding the defense together. What allows is to expand and contract so fast is the agility Thompson brings to the game. Watch again this effort on DeRozan’s shot. Thompson's truly the glue that holds the team's defense together. The Cavs head back to Toronto where the Raptors flipped the script on them last time. They play much better at home, just as many Cavs players (LeBron excepted) play worse on the road. Given how much the Cavaliers gameplan seemed to rely on forcing Toronto’s role players to make plays, on the road is where it would be most likely to happen, challenging the defensive scheme’s assumptions and forcing changes. We like that Kyrie hasn’t looked especially good but has distributed the ball and shown up enough to make the first two games relatively easy. And James has found another gear, beyond the one he’s shown to now, hinting at still a higher level nobody has really seen, even better than the last three games of last year’s postseason. That’s what makes them so fun to watch, the sense that magic’s happening. Finally, to the mea culpas. We promised to do post-gamers and have kind of fallen down on the job. The last two games of the first round we were out-of-town celebrating our birthday, making it difficult. This week’s games are really little just indolence. This isn’t a paid gig, and we already wrote the book, our chronicle of the championship season, King James Brings The Land a Crown. We’re doing these mainly to market the book, and just to give back a bit to those that have supported us over the years. Yet it’s hard to motivate like last year when it was for the title. Staying up until 5 a.m. to have it ready the next morning doesn’t seem super appealing. So we’re still feeling out how to do this and make it enjoyable. This time it means publishing 24 hours later. We hope that’s not the case again, but if it is, hopefully there will still be a few who find value in this in-depth kind of analysis. If not, well, we’re still having fun, so that’s enough for now. Six more victories until the Finals, fellas.